When the G20 leaders meet in November to discuss pressing global issues, it is imperative that they take action to address the needs of people living in the world’s poorest and most vulnerable countries. 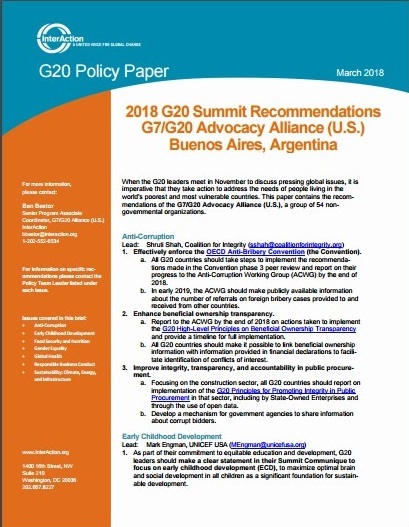 This paper contains the recommendations of the G7/G20 Advocacy Alliance (U.S.), a group of 54 non-governmental organizations. Download the full G20 Background Paper below. The corresponding G20 Policy Brief can be found here.